Distinctive white whales live in communal groups, migrate thousands of miles and raise each other’s young, but are being poached to stock aquariums. 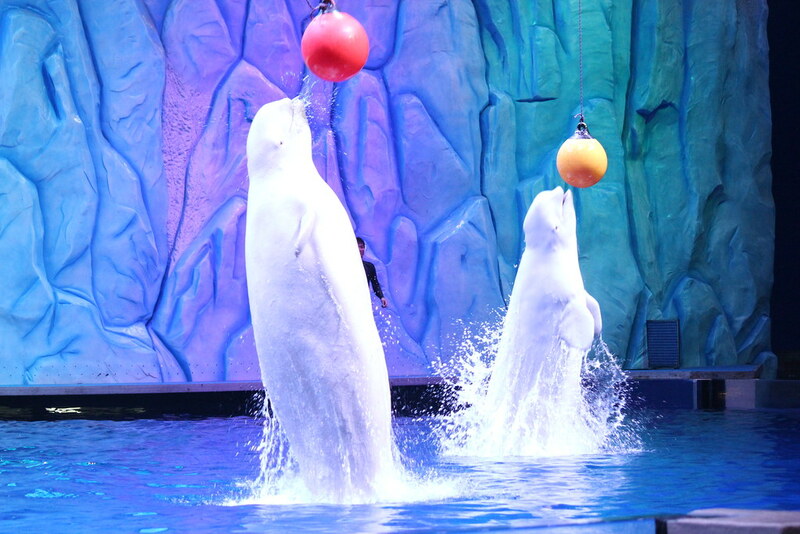 Beluga whales, also known as white whales, have an unusual colour which makes them one of the most familiar and easily distinguishable of all the whale species. They are also the smallest, ranging from four to six metres in length. They have rounded foreheads known as “melons” and they can change the shape of their forehead by blowing air through their sinuses. Due to their life within cold waters, they do not have a dorsal fin. This is to prevent heat loss to the environment when they surface for air. Instead of the dorsal fin, belugas have a dorsal ridge that helps them travel through sea ice waters. They also have a thick layer of blubber and thick skin as an adaptation to the cold environment. They are capable of diving to depths of 700 metres and can stay under the water for 25 minutes without returning to the surface for air. The IUCN believes there are more than 150,000 belugas in the wild, living in coastal waters of the Arctic ocean, off the shores of Russia, Greenland, Canada, Norway and Alaska. Belugas are extremely social animals generally living in groups of around 10 individuals known as “pods”. However, they have been known to travel in groups of several hundred individuals during feeding and may aggregate into larger groups that can include thousands of individuals. Pods are made up of males that have formed a bond with each other, or a group of females that travel together with their calves. Belugas are so social that their constant emission of squeaks and squawks has garnered them the nickname of “sea canaries”. Calves are born in estuaries, an environment which is largely heavy in silt and mud. These newborns are just under a metre long and can remain nursed by their mothers for up to two years. The milk that the calf receives is full of fat and nutrients that help it develop during its early stage of life. Young belugas are closely associated with their mothers and often ride on their backs while moving through the water. Beluga mothers get help in raising their calves from a community of sisters, cousins, aunts, and grandmothers. Many of these female relatives produce milk when another female's baby is born, even if they themselves have no nursing infant, allowing calves to feed from family relatives within their community. There is also a sense of maternal community among beluga mothers which form kindergarten groups, with 10 to 15 young calves playing and socialising under the care of a few watchful adults allowing the other mothers to go off to feed. Tragically, these communities and kindergartens are being torn apart for the circus and ocean park industries. Hundreds of young beluga whales are taken from the wild every year, with those who survive the process of capture enduring appalling welfare standards. They are denied the ability to socialise with family members, must adapt to an artificial diet, excessive noise and the proximity of people and unknown animals. They must also deal with the adverse impacts of swimming within chemically treated waters and are forced to perform meaningless tricks for entertainment. Natural behaviours such as migrating as much as 6,000 kilometres a year are impossible as the whales are kept in tanks far too small for their needs. This confinement and unnatural environment causes great stress, often resulting in increased aggression, illness and death. Promisingly, Russia declared in February 2019 that they would release 11 orcas and 87 beluga whales from sea pens in the Bay of Srednyya, where they have been kept captive since being caught last summer. The whales were expected to be sold to marine parks in China and their release is to be celebrated, although it is currently unclear if and when this might occur. Beluga whales are wide-ranging, social animals with diverse physical, social, behavioural and psychological needs. Poaching them from the wild, keeping them in captivity and forcing them to perform for our entertainment is cruel and unnecessary under any circumstances.